In the 1970s, major cities in Brazil like São Paulo or Río de Janeiro witnessed a massive influx of people from the countryside. At the time, more and more Brazilians were looking for an affordable place to live near the cities, as the urban centers offered a new range of income opportunities. Slowly, these newcomers occupied the cities’ wastelands, thereby founding the now well-known favelas. According to the 2010 Census, 11.25 million people live in the shanty towns spread all around the country, most of them located in the states of São Paulo and Río de Janeiro. 20 percent of Río de Janeiro’s inhabitants live in the city’s 752 favelas. The favelas sharply contrast with the dazzling, colorful reality presented by the government to international audiences. Although Brazil certainly made astonishing progress in poverty reduction and economic growth on the national level over the last two decades, the favelas are still witnessing high inequality and endemic violence. This short article aims at shedding light on some of the conflict dynamics of Rio’s favelas. The world’s fourth largest democracy has been struggling over the past years with its biggest monsters. Corruption scandals, economic crises, and major disapproval among the population regarding the hosting of international sports events have been in the focus of international media reporting about Brazil. However, the cariocas (the Brazilian name depicting Rio´s inhabitants) are dealing with a militarization of their daily life. In late November 2016, during shootings between drug traffickers and police agents, a police helicopter crashed into a favela, leaving four officers dead and an atmosphere of uncertainty among the inhabitants. In another instance, military police (PM) used armored vehicles during an operation against drug trafficking organizations (DTOs) in the favela “Cidade de Deus”, seizing drugs and arresting several alleged drug traffickers. The subsequent shootings left seven alleged drug traffickers dead and another person injured. In Brazil, drug traffickers and police are constantly fighting each other, with the former trying to retain their power over the favelas, and the latter trying to re-establish the state’s monopoly on the use of force in the area. This conflict takes place on the streets of the city, affecting not only the people involved in it, but everyone living in the shanty-towns. Three DTOs primarily operate in Río de Janeiro: Comando Vermelho (CV), Terceiro Comando da Capital, and Amigos dos Amigos. In addition, there are several militias which grew out of community projects initiated to protect the population against organized crime, but, as the DTOs themselves, ended up being involved in criminal activities, such as extortion and drug and weapon trafficking. The DTOs emerged from the Brazilian prisons in the 1970s and 1990s. Convicts without prospects to integrate into the Brazilian society saw the DTOs as a way of earning not only a living, but also social recognition. As time passed, the CV ended up operating mostly in Río de Janeiro, while the Primeiro Comando da Capital (PCC) was mostly based in the state of São Paulo. Both have been simultaneously engaged in criminal activities, competing with the state for the control over the favelas and those prisons that they use as command centers. According to police and media reports, the PCC’s network currently comprises about 6,000 members. This number does not include the scores of foot soldiers working for the DTOs, often being young men living in the favelas, willing to fulfill orders to kill or blackmail. The government has tried to regain control over those favelas in different ways. Firstly, it launched a decisive campaign of repressive police action. According to Human Rights Watch, Brazilian PM killed 20 persons per month in 1997. Ten years later, the number had risen up to 1,330, while it could not be fully proven that the killings were all acts of self-defense. The operations were started by the Police Special Operation Battalion (BOPE), an MP unit in Rio de Janeiro. The BOPE usually entered the favelas using caveirãos, armored fighting vehicles. This heavy use of violence during BOPE´s operations caused distrust among the inhabitants of the favelas and did not really solve the insecurity problems. Secondly, in 2009, authorities implemented a project of community-based policing. So-called Pacifying Police Units (UPP) were deployed to improve the police’s reputation in the favelas after the cariocas had criticized security forces for their disregard of human rights. The project intended to improve the troubled relationship between the community and the police. After all, most inhabitants of the favelas said they neither sympathize with the criminals involved in drug trafficking, nor did they trust the police. In their opinion, the national security forces always see them as potential DTO members, an attitude that leads to animosity between the community and the state. 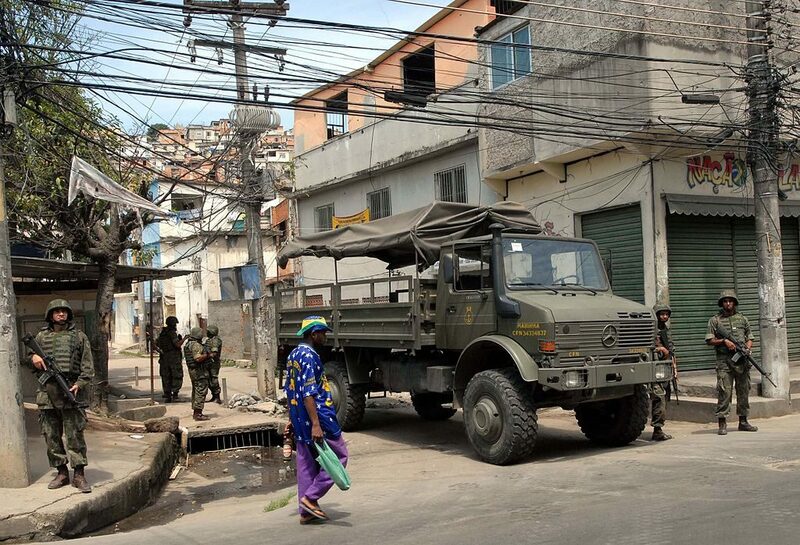 After the BOPE have cleared the territory from the most urgent security threats, the UPP stations are installed and the BOPE agents leave the favelas. The UPP consist of unarmed police agents living within the favelas and providing security to its inhabitants. Despite these efforts, Río’s police is still one of the most violent in the world, far from having succeeded in establishing normal relations with the inhabitants of the favelas. The power of the DTOs is not only present in the favelas, but also across borders. Over the past years, drug gangs have been using Paraguayan territory and criminal structures as a base for their operations. They have also been trying to gain more control over the drug business there. For example, in the summer of 2016 CV and PCC worked together, reinforcing the alliance they seemed to have established to gain control over the drug business in Paraguay. PCC and CV members cooperated in an operation in Ponta Porã, southern Brazil, that targeted the Paraguayan business man and drug trafficker Jorge Rafaat Toumani. He served as intermediary between drug producers in South America and DTOs in Brazil, especially PCC. Toumani was killed in an ambush that involved about 100 men. The attack demonstrated that Brazil’s biggest criminal organizations took the control over the transnational drug trafficking between Paraguay and Brazil. Nevertheless, this alliance was short-lived. Amidst the prevailing political and economic crisis in Brazil, average citizens lost trust in their politicians. Furthermore, Río de Janeiro has financial problems after hosting the Olympics. This situation amplified competition between criminal gangs in the favelas. Prison riots in mid-October 2016 showed how the alliance between PCC and CV broke, and the dictum “DTOs are at war” became reality in the favelas. Within just one week, Río de Janeiro’s inhabitants reported more than 750 shootings in different locations. According to public prosecutor, Lincoln Gakiya, the rupture between the two biggest DTOs in the country began as CV started to associate itself with smaller criminal organizations operating in other states, which are enemies of PCC. Today, Brazil is the seventh most violent country in the world. In 2014 alone, 60,000 people were murdered. Eight years after the implementation of UPP stations in Río de Janeiro’s favelas, the security problems have not yet been solved by the state. The plan to finally recover the lost territories of Río de Janeiro by the means of a community police have not brought the desired results, neither for the government, nor for the favelas’ population. In this way, they remain caught in the middle of a conflict between criminal gangs, militias, and police forces. In this article, I described the militarization of the cariocas’ daily life in the favelas. Fortunately, this reality is now taken up in the national political arena. In lack of successful state policies, inhabitants of different favelas in Río de Janeiro founded a political party called Frente Favela Brasil. This party wants to offer a space for new policies intended to make the life in the favelas more fair and secure.